We present a novel ionospheric tomography reconstruction method. The method is based on Bayesian inference with the use of Gaussian Markov random field priors. We construct the priors as a system of stochastic partial differential equations. Numerical approximations of these equations can be represented with linear systems with sparse matrices, therefore providing computational efficiency. 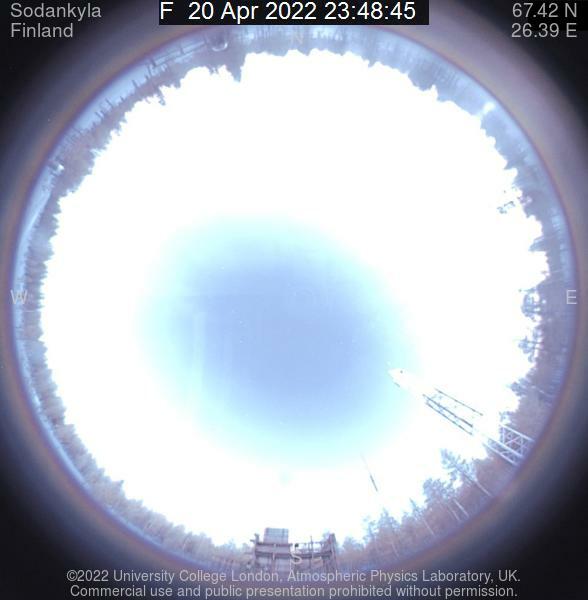 The method enables an interpretable scheme to build the prior distribution based on physical and empirical information on the structure of the ionosphere. We show through synthetic test cases in a two-dimensional setup of latitude-altitude slices how this method can be applied to satellite-based ionospheric tomography and how information about the structure of the ionosphere can be implemented in the prior. The technique is capable of being easily extended to multi-frequency tomographic analysis, or used for the inclusion of other data sets of ionospheric electron density, such as ground-based observations by radars or ionosondes. The standard KAIRA experiment, which is always left running if the station is not being used for campaign experiments, includes a beam which continually observes the strong natural radio source Cassiopeia A at several frequencies spread over the KAIRA low-band. Simultaneously, all-sky images are taken at a single observing frequency with a one second cadence, such as the example below, in which Cassiopeia A is easily identified (it's the strongest source, the other easily identifiable source is Cygnus A). 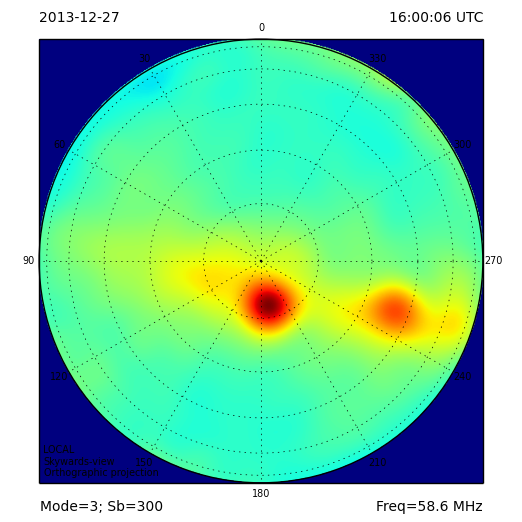 On Chirstmas Day 2013 a period of very strong ionospheric scintillation (the "twinkling" of radio sources due to density variations in the ionosphere) was observed, for which a movie of all-sky images was created in which the dominant sources can be seen flickering and sometimes changing position and shape (see the KAIRA blog post). 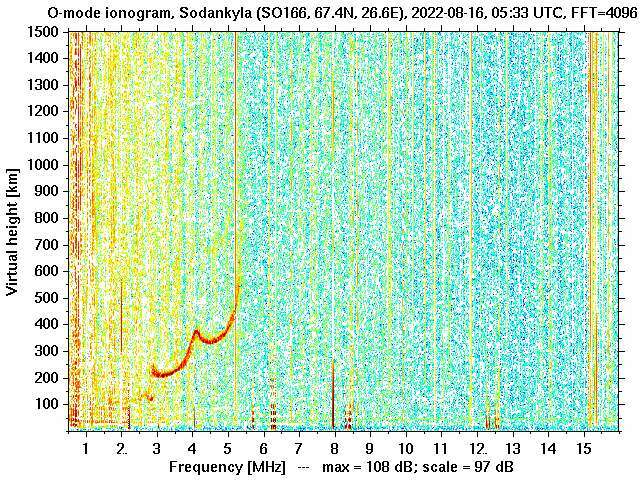 I am now in the process of analysing these data to investigate the phase-shifting of the radio signal from Cassiopeia A caused by the density variations moving through the ionosphere. 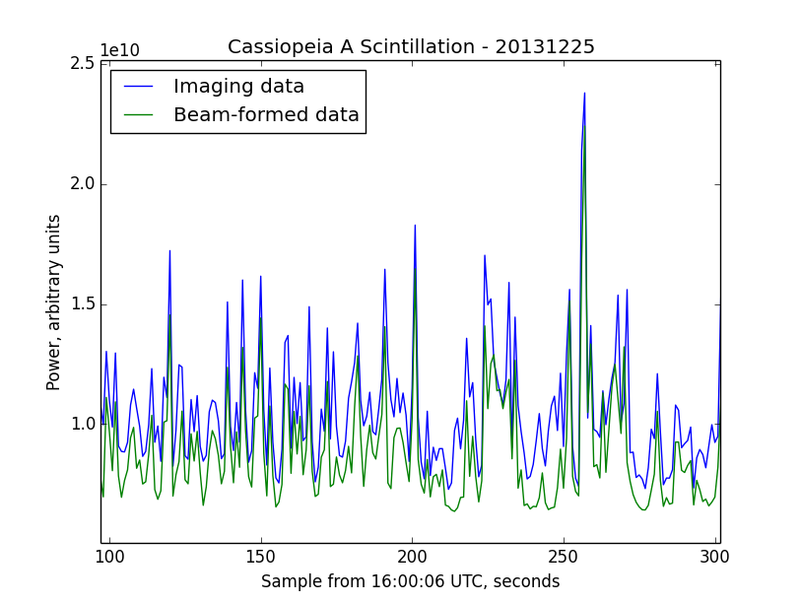 As a first stage of this, I've been looking at the intensity of Cassiopeia A as measured from the images and comparing it to the intensity measured by the beam-formed data looking directly at this source. A first comparison is below. As can be seen, the two time series' match almost exactly. Whilst this is hardly surprising, it is a relief to know that the code used to identify Cassiopeia A in the imagery is working as expected. SGO is back in operational Antarctica measurements. 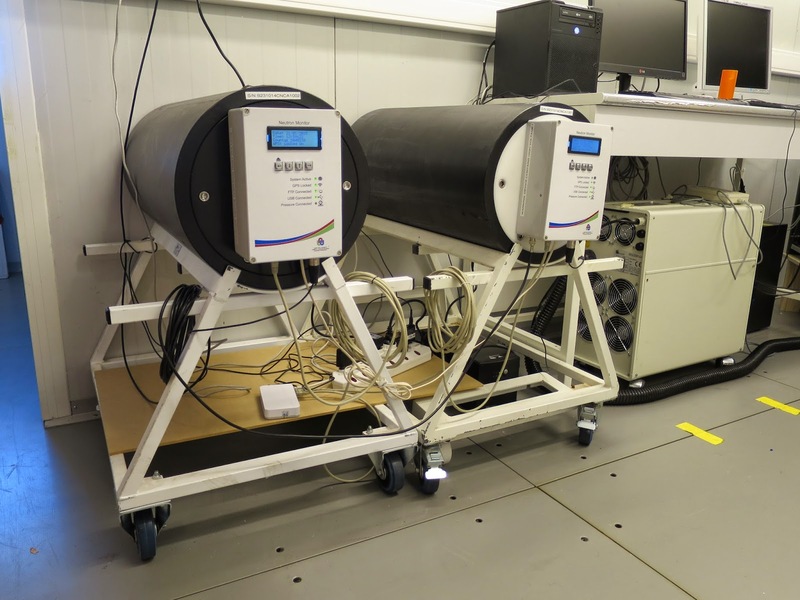 Our cosmic ray research group has new neutron monitors in operation at Concordia station. Here is a photo of our two NM units in the physics shelter at Concordia. According to Ilya, data analysis is in progress. Hence, we will get back to them later on, i.e. follow-ups on the way. It's a mid-January tradition in Sodankylä, that the local vocational school organises the annual Northern Lapland Education Fair. 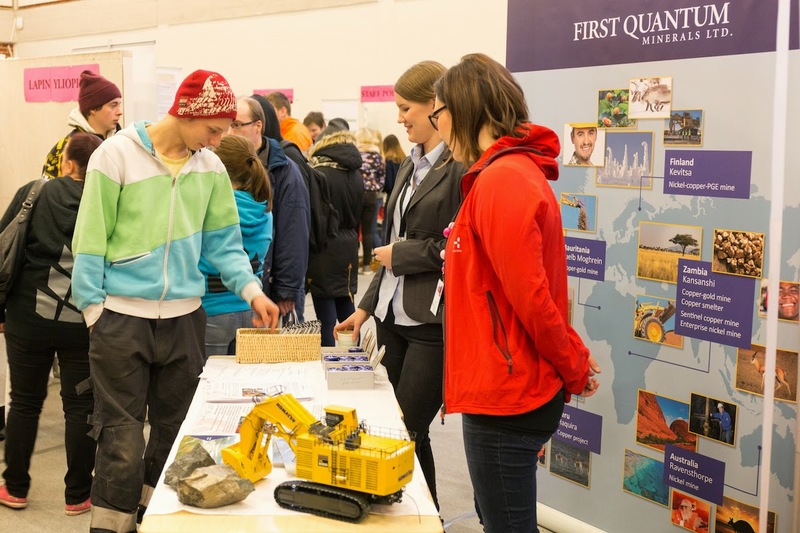 For the 17th time, the fair took place yesterday, 15th January 2015, and of course the University of Oulu, of which Sodankylä Geophysical Observatory is an independent department, took part as well. 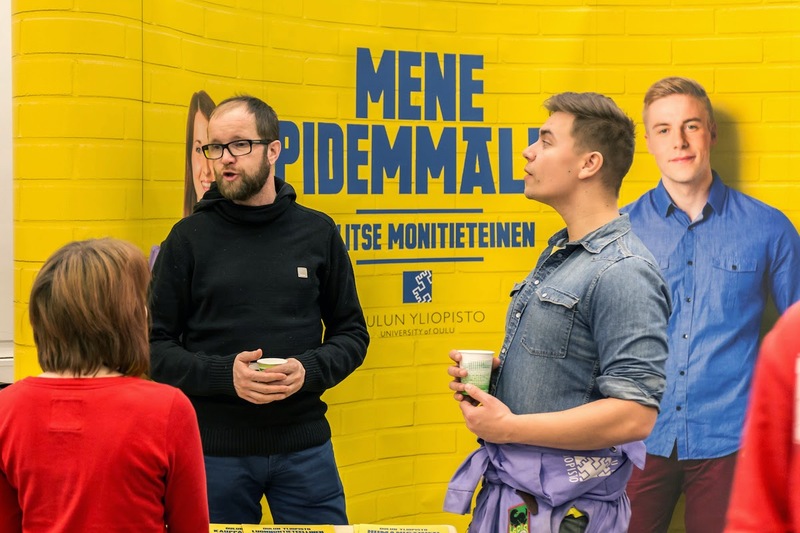 The university had their trademark bright-yellow stand deployed, and Kimmo Kuortti (left) and Uula Neitola (right) were happily overwhelmed by the interest, running out of brochures all too soon. A big thank you to all the young people of Sodankylä and Northern Lapland, who showed their interest and asked a lot of questions! Next year there'll be more brochures available! 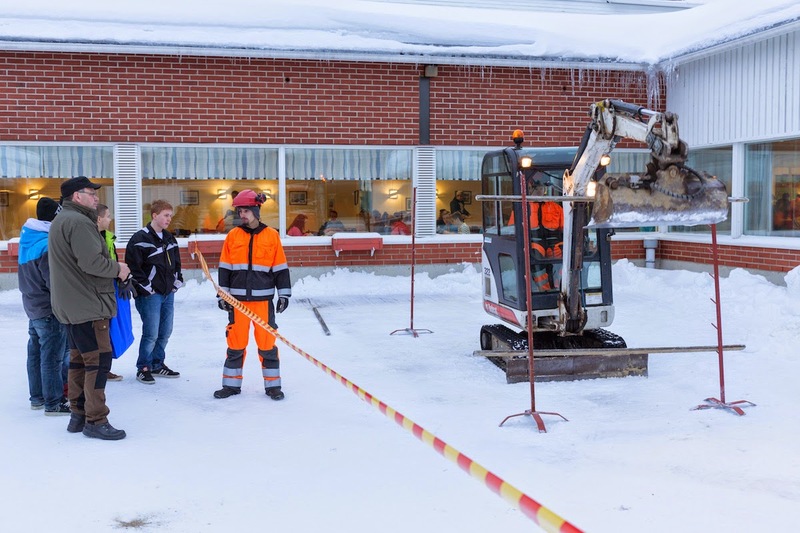 Among other examples of vocational educational programmes are the machine operators, who displayed their skills by carefully moving a long stick around using a mini digger. Also the local Kevitsa mine was represented recruiting trainees and students looking for summer jobs. 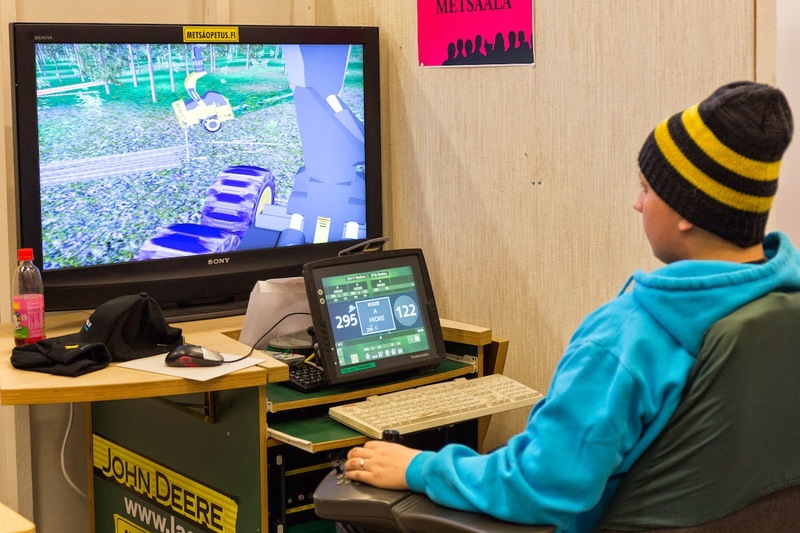 A final example of the fair's exhibits is this computer, which is a realistic simulator of a forestry machine. The next educational fair will take place in January 2016. 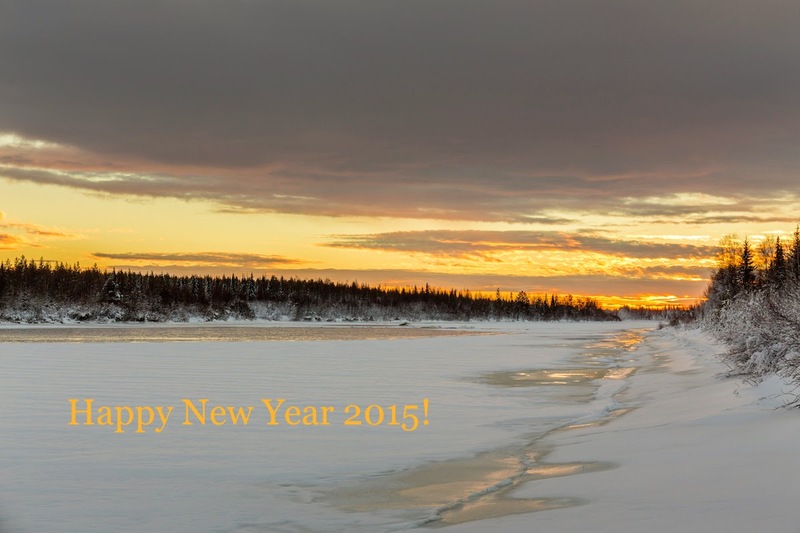 If you want to know more about studying at the University of Oulu, please visit their web site at www.oulu.fi. It gets cold in Sodankylä in January. 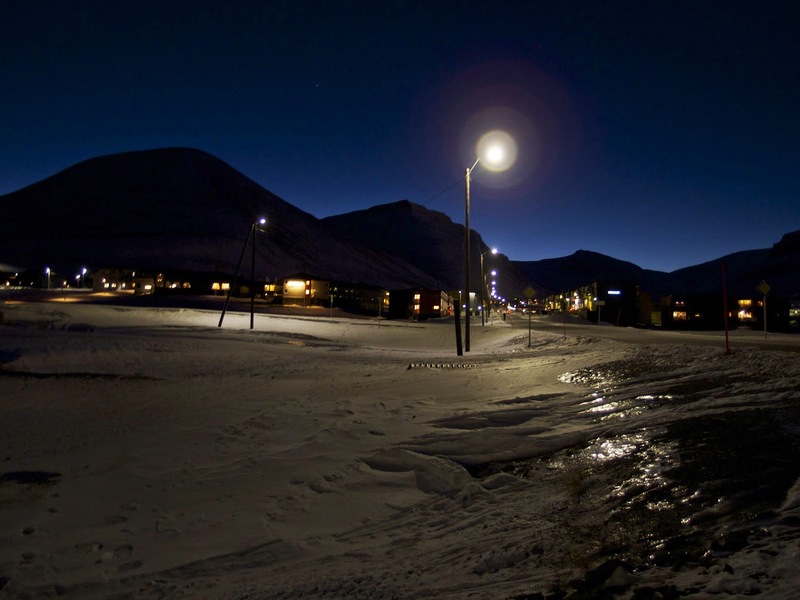 This is the coldest month here, and last night the thermometer bottomed out at –39.5°C! It's the coldest we've seen in many years. There used to be always some days of –40°C here in January, but not in recent years. 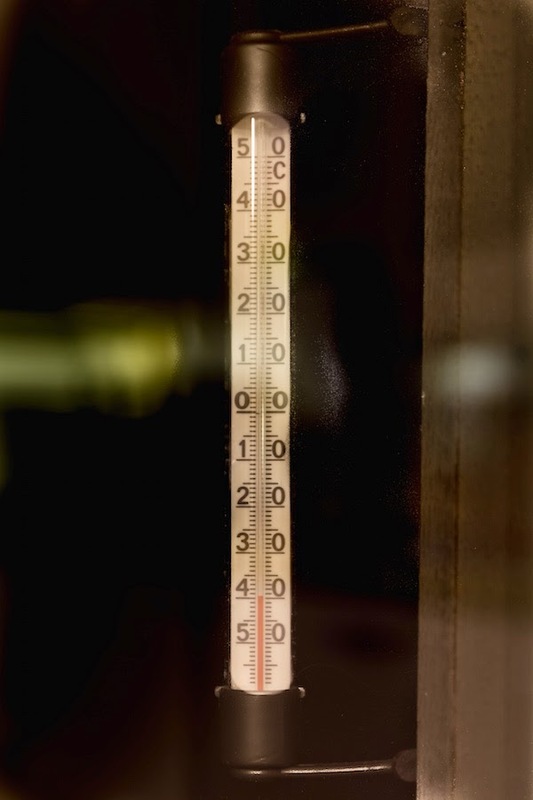 Incidentally, –40° is the same on both the Celsius as well as the Fahrenheit scale. Our sincere congratulations to our friend and colleague, Prof Mike Lockwood of the University of Reading, UK, on the occasion of being awarded the Gold Medal in Geophysics of the Royal Astronomical Society for his contributions to space physics, including his work on long-term solar variability and its effect on the Earth's climate. For the official announcement, please refer to the Royal Astronomical Societies' web site. Congratulations from your SGO colleagues, Mike, well done!